Following Friday's correction, Crude oil is still trading lower to start the week on a bearish note after hitting multi-year highs. This pullback came after Saudi Energy Minister, Khalid Al-Falih, said that Saudi Arabia was planning to invest $20 billion in the next few years to maintain and possibly expand its oil production capacity. On top of that, Goldman Sachs argued that there could be a surplus in Crude inventories early 2019. In addition to that, Qatar's Energy Minister Mohammed Al-Sada said on Sunday, according to Reuters, that the oil market is balanced in terms of supply and demand and geopolitical changes are the reason for the rise in crude prices and he also said that OPEC are going to take into account geopolitics in their next meeting. After hitting a multi-year high at $76.9, a level that have not been seen since November 2014, Crude oil prices retreated more than 4% since then. 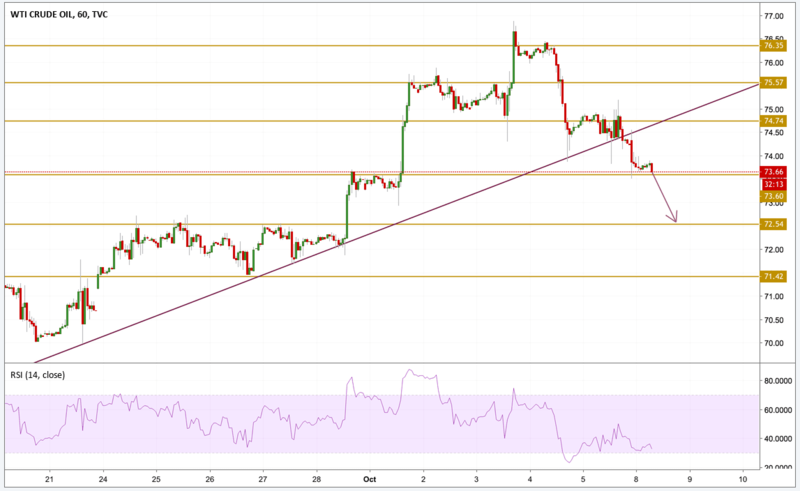 Divergences between momentum and the price have pushed the price lower and forced it to break below the purple trend line presented on the chart which was an important, well-respected support. From here if the $73.60 support level is violated, then the $72.6 will be our next level to watch.